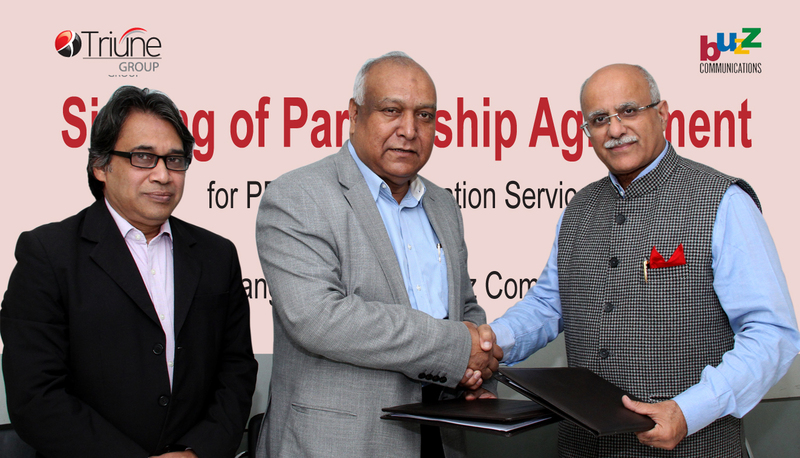 Bangladesh’s leading PR & communications agency Triune Group has entered into a partnership agreement with India's BUZZ Communications to extend PR services to to their clients in each others’ territories. Under this agreement, Triune Group will offer full PR & communication services to its clients in Bangladesh for the Indian market, through their partner – BUZZ Communications, while clients of BUZZ Communications will be able to use the services of Triune, in taking their PR and Communication engagements to the next level in Bangladesh. The new strategic partnership will align the two in order to better integrate a client’s traditional and digital outreach. Kazi Wahidul Alam, managing director and CEO of Triune Group and Achal Paul, founder director, BUZZ Communications signed the agreement at Triune office. (See Right) . Kazi Wahidul Alam, managing director & CEO, Triune Group said that, "An increasing number of Bangladeshi enterprises are now entering into Indian markets with their products and services and Triune Group will be able to offer them PR services in any part of India to effectively promote them through BUZZ." Explaining the rationale behind expanding services in Bangladesh, Achal Paul, founder director, BUZZ Communications, said, "Bangladesh’s economy is now one of the fastest growing major economy and its' financial sector is the second largest in South Asia. With its industrial growth, consumer base and increase in their purchasing powers, many Indian and International organizations are now taking interest in this market. In order to penetrate and market their products, they all would need PR and promotional services."